FREE tours of the Massillon Museum are available for all age levels, from Kindergarten to adults! Donations to help support our Museum, no matter how large or small, are always appreciated. Questions? Contact Megan Fitze, Education and Outreach Manager by phone 330-833-4061 x 104 or by email. 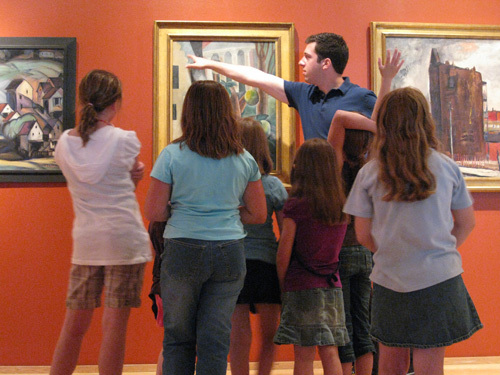 Museum staff and volunteers can provide a general tour of the Museum or focus on specific curriculum requirements or topics of interest for your group. Guided tours are offered throughout the week, during normal hours of operation: Tuesdays – Fridays, 9:30 – 5:00pm. Additional times may be available after hours, on Mondays, or weekends, by special arrangement. Please note the Museum hosts a robust number of events and tours, and cannot always accommodate requested dates. Please allow at least 4 weeks before the date of your proposed tour, and be sure to check our Current Exhibit Schedule and Upcoming Exhibit Schedule to see what will be on display when you’d like to visit. To schedule a tour, call the Museum at 330-833-4061 x104 or send a completed TOUR REQUEST FORM to the tour coordinator by email. Please review the tour guidelines below. School Busing Reimbursement: $200 busing reimbursement will be provided to schools in which 75% of the student population qualifies for the National School Lunch Program; reimbursement is privately funded as well as grant funded, and is distributed on a first-come, first-served basis as funds allow. Schools must submit an invoice to the Museum before being reimbursed. Cancellation policy: A 24-hour notice must be given for tour cancellation. If cancelling within 24 hours of a tour with an art project, you will be charged a fee of $50. For tour cancellation only (a tour with no art project), no fee will be assessed for the first cancellation. For a second cancellation, a $20 administrative fee will be assessed. If you would like to bring your class or group in for a self guided Museum visit, please be sure to call us in advance to make sure the galleries are not closed for installation and there are no special events. Please check in at the front desk to let us know how many are in your group, and review the tour guidelines below. An exhibition related hands-on activity can be arranged through the Education Department to enhance your tour and visit to the Massillon Museum. Sharpie tie dye, Photobooth pictures, clay Cryptozoology tracks, and Mexican Dia de Los Muertos sugar skulls are just a few of our most popular art projects! We can tailor an art project to meet your curriculum needs, using themes of art, science, history or literature. The cost for art + history projects is $3 per Massillon City resident and $5 per non-resident. 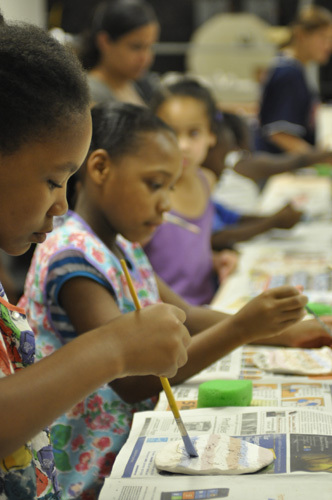 The Massillon Museum provides the instructor and supplies for these activities. Payment may be made in cash, check or credit card. For questions, contact the museum by phone 330-833-4061 or by email. No backpacks, headphones, food or drink are permitted in the Museum galleries. A coatroom is available in the lobby to store personal items. Please turn mobile phones on silent. Photography (no flash) is permitted in certain galleries. Please ask permission from a staff member before taking photographs. If you are taking notes, please use pencil while in the galleries. One actively engaged adult chaperone (18 and older) is needed for every 10 elementary students. One actively engaged adult chaperone (18 and older) is needed for every 15 junior high and high school students. Activity level and tour schedule may alter the chaperone numbers needed. Please do not touch artwork or objects in the Museum exhibits, or lean against walls or Museum cases in the galleries. The Massillon Museum is handicap accessible.